The beautiful granitic islands of the Seychelles archipelago cluster around the main island of Mahé. On Mahé you find the international airport and the capital, Victoria. Mahé together with Praslin and La Digue, form the cultural and economic hub of the nation and contain the majority of Seychelles’ tourism facilities as well as its most stunning beaches. The Seychelles is home to no less than two UNESCO World Heritage Sites: the legendary Vallée de Mai on Praslin where the wondrously shaped Coco-de-mer nut grows high on ancient palms and fabled Aldabra, the world’s largest raised coral atoll, first seen by early Arab seafarers of the 9th century A.D.
Unspoiled islands of fine white sandy beaches washed by the warm waters of the Indian Ocean. The enchanting granite islands of the Seychelles archipelago are one of the world’s very last frontiers. Lush tropical vegetation and exotic palms, spectacular views and dazzling coral reefs, the Seychelles has it all. An exciting yet tranquil island destination, the Seychelles offers breathtaking natural beauty in pristine surrounds, still untouched by man. 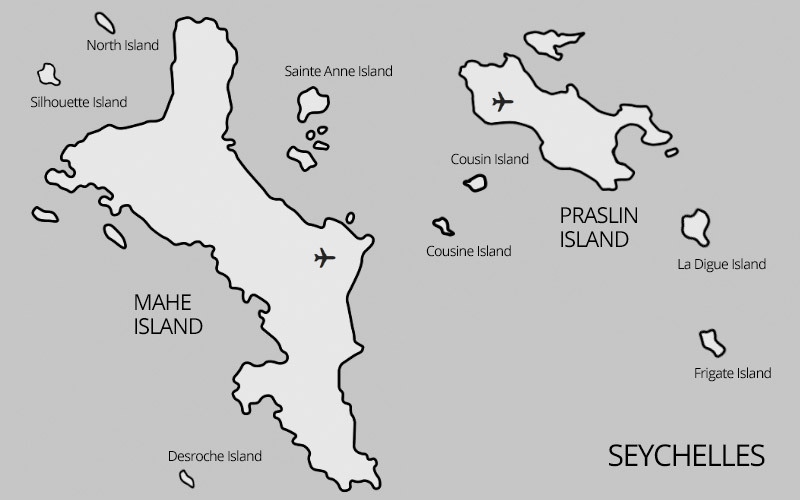 Seychelles can trace its first settlement back to 1770 when the islands were first settled by the French, leading a small party of whites, Indians and Africans. The islands remained in French hands until the defeat of Napoleon at Waterloo, evolving from humble beginnings to attain a population of 3,500 by the time Seychelles was ceded to Britain under the treaty of Paris in 1814. Under the British, Seychelles achieved a population of approximately 7000 by the year 1825. Important estates were established during this time producing coconut, food crops, cotton and sugar cane. During this period Seychelles also saw the establishment of Victoria as the capital, the exile of numerous and colourful troublemakers from the Empire, the devastation caused by the famous Avalanche of 1862 and the economic repercussions of the abolition of slavery. Seychelles’ humid climate is always warm and without extremes. 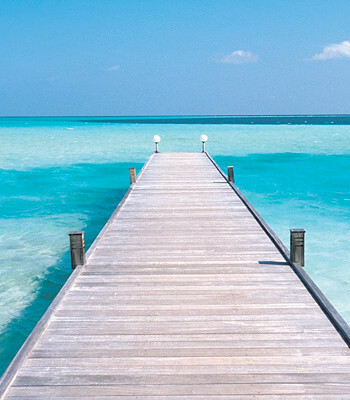 In this tropical paradise the temperature seldom drops below 24°C or rises above 32°C. All but the remotest southern islands lie comfortably outside the cyclone belt making Seychelles’ a year round destination for sun worshippers and beach lovers. Between the months of October and March the north-west trade winds visit and the sea is generally calm and the weather warm and humid, with average winds of 8-12 knots. In January and February the islands receive their life-giving rains, rejuvenating the rivers and streams and teasing the vibrant foliage into rainbows of colour. The months between May and September bring drier, cooler weather, and livelier seas – particularly on south-eastern coasts – and winds of 10-20 knots. The table below is courtesy of the Seychelles Meteorological Services. Take a look at our Seychelles Map and see which Island you would like to visit for a fantastic Seychelles Holiday. Mahé, is the largest island and cultural and economic hub of the Inner Islands. The island measures 28km long by 8km wide (154.7 sq kilometres), and is the international gateway to Seychelles. It is home to the international airport and the nation’s capital, Victoria. The island is home to almost 90% of the total population reflecting Seychelles’ diverse ethnicity and descent from African, Indian, Chinese and European populations, and is the seat of government and the chief centre of commerce. With a backdrop of imposing 1000m granite peaks, Mahé is an extraordinary treasure trove of flora that has evolved over centuries of splendid isolation. Rare endemic plants found nowhere else in the world adorn Mahé’s mist forests in mountain strongholds, such as the Jellyfish Tree, the carnivorous Seychelles Pitcher Plant and the Seychelles Vanilla Orchid. The popular holiday island of Praslin is Seychelles second largest island, covering an area of 37.56 sq kilometres. It lies 21 miles (34km) north-east of Mahé in the Seychelles archipelago, a popular stop for cruise liners and a vacation destination for honeymooners and beach lovers. Praslin is the site of the fabulous Vallée de Mai, one of Seychelles’s two UNESCO World Heritage Sites. The island features truly exquisite beaches such as Anse Lazio and Anse Georgette, both sporting coral reefs and crystal clear waters. Both of these popular beaches have appeared on the top-10 list of world’s best beaches in recent years. 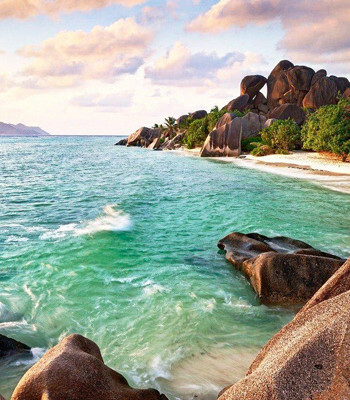 Close neighbour to Praslin, La Digue is the fourth largest island in Seychelles. La Digue is an island where time stands still and time-honoured traditions such as travelling by ox-cart and bicycle are still king. Traditional methods of boat building and refining of coconut products (copra) are still practised on this beautiful island. The friendly atmosphere of this intimate island with its languid pace of life, traditional architecture and breathtaking beaches, such as legendary Anse Source d’Argent, is an absolute must for visitors. It boasts numerous and diverse accommodation for visitors, and its picturesque satellite islands nearby are ideal for snorkelling and diving excursions. La Digue takes its name from one of the vessels in explorer Marion Dufresne’s fleet, sent by the French to explore Seychelles’ granitic islands in 1768. Apart from hosting the Seychelles’ black paradise flycatcher, one of the rarest birds on earth, La Digue’s biodiversity features such stars as the Chinese Bittern, Cave Swiftlet, Waxbill as well as two rare species of Terrapin. The islands forests also contain a wealth of flora in the form of delicate Orchids, tumbling vines of vanilla, as well as trees such as Indian almond and Takamaka. Gardens blaze with hibiscus and nepenthes against a backdrop of swaying coconut palms. Time: Seychelles local time is GMT +4 hours. Electricity: Electrical current is 220-240 volts. Plugs are the three prong square pins used in England. Language: There are three official languages in Seychelles: Creole (a lilting, French-based patois), English and French. Many Seychellois also speak fluent Italian or German. Telephone Dialling Code: The international access code for Seychelles is +248. The outgoing code is 00 followed by the relevant country code (e.g. 27 for South Africa or 44 for the United Kingdom). Currency / Money: The Seychelles currency is the Seychelles Rupee (SCR). Visitors to the islands are required by the country’s foreign exchange regulations to pay for all services provided by hotels, guesthouses and self-catering enterprises in major foreign currency notes or by credit card. Rupees can only be used for taxis, in local shops, bars, markets and restaurants outside major hotels. Restaurants in certain hotels will accept international currency as well as Rupees. Money can be exchanged at banks, major hotels and at the airport on Mahé. Travellers are recommended to use their Seychelles Rupees before leaving as changing Rupees back into foreign currency on departure requires the official receipt from the initial transaction. ATMs are available at major banks on Mahé, Praslin and La Digue. Tipping: Tipping is not obligatory, as bills for most services do a include service charge of between 5 and 10%. However additional tipping is appreciated for exceptional service. Passports & Visas: Generally no visa is required by any nationals who wish to enter Seychelles as long as the passport is valid form the date of entry until the passengers final destination and passenger is in possession of a return ticket. A visitor’s permit is issued upon arrival for a period of one month (subject to the validity of return / onward ticket) and can be extended for another 2 months depending on the Immigration in the Seychelles (A total of 3 months altogether). Note: Entry requirements change, sometimes with little notice. Please CHECK with your World Wide Island Tours consultant regarding updates at the time of making a travel enquiry. Health Requirements: The information shown below is general with regard to health requirements. These do change on a regular basis so check with your World Wide Travel West Coast consultant at the time of making a travel enquiry. Compulsory vaccinations: Yellow Fever (if coming from an Endemic Country or if been in contact with any East-African country and South American countries falling within the Yellow fever belt. For further information on the Seychelles, please visit the official Seychelles Tourism website.